Chapter wise important revision notes on Chapter-5: Magnetism and Matter (Part II) of CBSE class 12 physics are available in this article. These notes are useful for revision purpose before exams. The earth behave likes a huge bar magnet. Strength of the earth’s magnetic field varies from place to place on the earth’s surface. The magnitude of the earth’s magnetic field is of the order of 10–5 T.
• The magnetic field of the earth is thought to arise due to electrical currents produced by convective motion of metallic fluids (consisting mostly of molten iron & nickel) in the outer core of the earth. This effect is also known as the dynamo effect. • In outer layers of earth’s atmosphere, various gases are in ionized state. Due to rotation of the earth about its axis, strong electric current are set up due to movement of charged ions. Magnetic field lines of the earth resemble with a (hypothetical) giant magnetic dipole located at the centre of the earth. The axis of the dipole does not coincide with the axis of rotation of the earth. • The axis of the dipole is titled by approximately 11.3º with respect to the later. • The magnetic poles are located where the magnetic field lines due to the dipole enter or leave the earth. • The pole near the geographic north pole of the earth is called the north magnetic pole. • The pole near the geographic south pole of the earth is called the south magnetic pole. • Nomenclature of the poles is confusing and one should not get confuse. 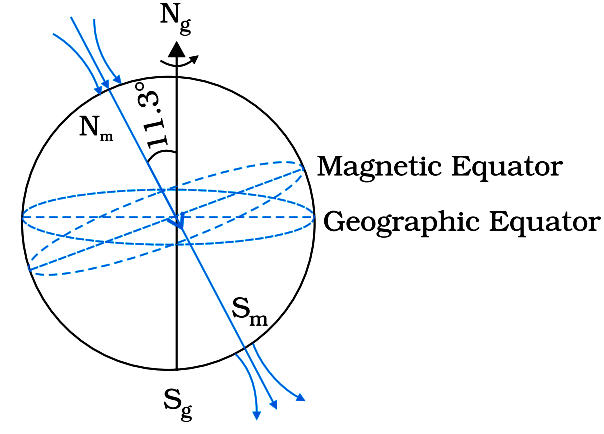 If we look at the magnetic field lines of the earth (as shown in figure given above), we observe that unlike in the case of a bar magnet, the field lines go into the earth at the north magnetic pole (Nm) and come out from the south magnetic pole (Sm). • The convention arose because the magnetic north was the direction to which the north pole of a magnetic needle pointed; the north pole of a magnet was so named as it was the north seeking pole. • The north magnetic pole behaves like the south pole of a bar magnet inside the earth and vice versa. These are the quantities which completely describe magnitude and direction of the earth’s magnetic field at a place. It is the angle between magnetic meridian and geographic meridian at a place. 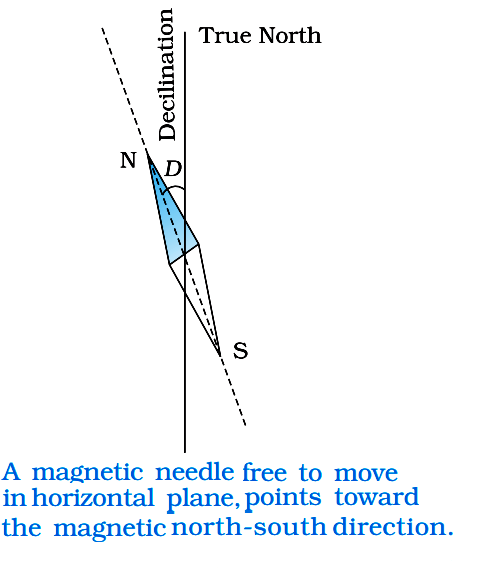 In the figure shown above, the angle between the true geographic north and the north shown by a compass needle is called the magnetic declination or simply declination. The declination is greater at higher latitudes and smaller near the equator. The earth’ magnetic field is nowhere horizontal except at equator. So, at any place, the earth’s magnetic field (BE) in the magnetic meridian may be resolved into a horizontal component (HE) and vertical component (ZE). The horizontal component of the earth’s magnetic field is the component of the earth’s magnetic field in horizontal direction. Angle of declination at a place is the angle between the direction of the earth’s magnetic field and the horizontal in the magnetic meridian at that place. At certain points the field due to a bar magnet may be completely neutralized by the horizontal component of the earth’s magnetic field. These points are known as neutral points. If a magnetic needle is under the influence of two uniform magnetic fields B1 and B2 in mutually perpendicular directions, then, the magnetic needle will align itself along the resultant field. 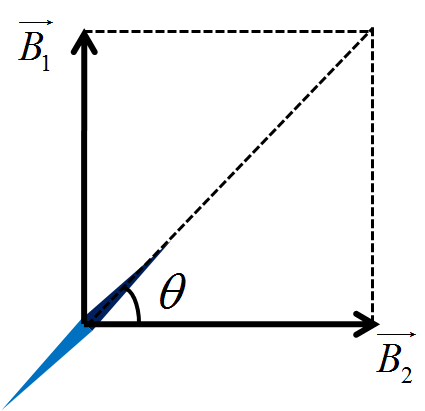 In the figure shown above, if the resultant of B1 and B2 makes an angle θ with B1, then, tan θ = |B2|/|B1|.